A recent Bundesliga article revealed details of the remarkable effort to monitor and record what happens during games in Germany’s top soccer league. Behind the scenes, as many as 50 observers and analysts from the DFL Digital Sports department review each game, accounting for every player’s movement. Even the smallest details are captured, compiled, and centrally stored for future use. For teams competing in Germany’s top league, tracking the number of sprints, tackles, balls and corners won, and kilometers covered are only the tip of the data iceberg. Sifting through the data, analyzing it, and transforming it into competitive advantages is one of the most exciting and challenging jobs in today’s sports world. Of course, what happens on the field can be seen by anyone, but what about what’s happening below the surface? How are individual players doing at a physiological level? Firstbeat Sports heartbeat monitoring and advanced analytic tools play a big role in this effort by giving teams the physiological data they need to place training prescriptions and decisions on firm scientific ground. Fitness testing, intensity tracking, training load metrics, and recovery data are all among the tools trainers rely on to help guide each player safely towards their maximum potential. Physiological data is part of the game these days, whether it’s spotting lingering fatigue after a big game, refining practice schedules, or green lighting extra effort when things are going well. In the big picture, these insights facilitate training plan individualization, but they can also be used at micro level to intervene and modify specific training activities on the fly. On a recent visit, Firstbeat’s Christoph Rottensteiner, PhD, caught up with longtime Hertha BSC trainer Henrik Kuchno to discuss how the team is putting this data to work as they battle for position in the Bundesliga and in the UEFA Cup standings. 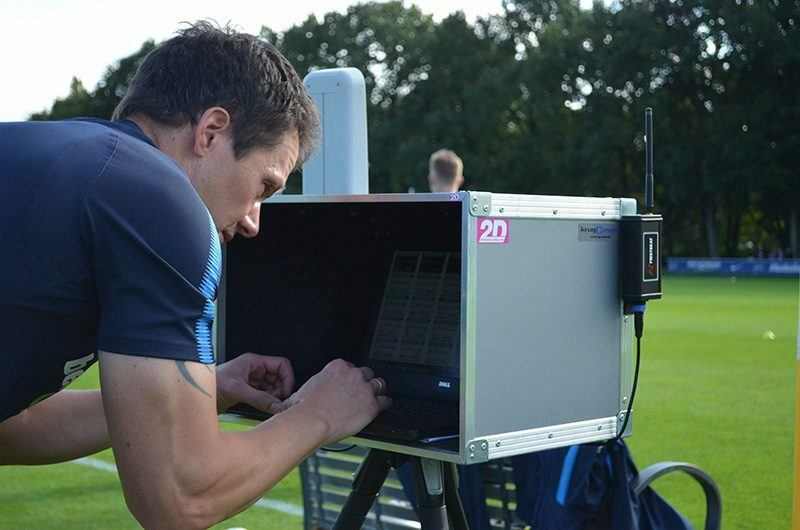 Bundesleague Team Hertha BSC records every training session with the Firstbeat Sports system. 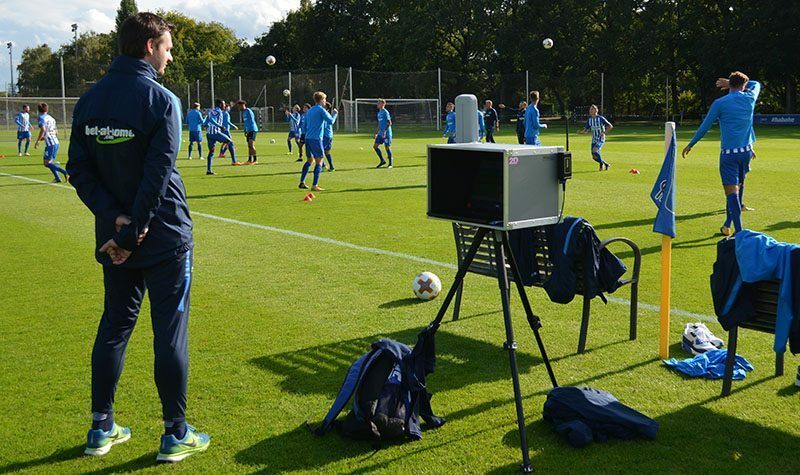 Using the Firstbeat Sports platform to monitor training allows Hertha BSC to quantify training loads and watch those loads accumulate in real time. This data is supplemented with external player load data from the team’s GPS monitoring system. Kuchno combines insights from both platforms and then distributes them to the rest of the coaching staff. “The ability to see high-intensity training minutes is especially helpful. The time element of the metric makes it easy to understand and communicate to other coaches, the medical department, and to players,” explains Kuchno. It also gives members of the coaching staff an opportunity to put data to work in ways that directly improve the training process. Unlike the DFL’s Digital Sports department, Kuchno doesn’t have an army of staff available to manage the data, it’s up to him. And since capturing each player’s physiological responses is only one of his many tasks, it’s vital that things run smoothly. To help players maximize the benefit of their training efforts, Kuchno works step-by-step with each player on the roster to provide valuable insight for the road ahead. One such insight comes in the form of Firstbeat’s Quick Recovery Test. The 3-minute test relies on an analysis of beat-to-beat changes in a player’s heart function (HRV) to reveal their current recovery status and performance readiness. Hertha BSC players benefit from Kuchno’ s lengthy experience working with this type of data. His expertise and the Firstbeat analysis help reduce unwieldy raw data into precise insights. Mounting evidence shows this type of performance readiness data holds valuable clues for reducing injuries and individualizing daily training activities in ways that give each player the best chance of reaching their potential. Athletic Coach Henrik Kuchno always has an eye on the real-time data. The only equipment players need to perform the test is a simple heart rate monitoring chest belt that wirelessly transmits data back to a laptop where the analysis is performed. Kuchno keeps the belts within easy reach. He also improves the reliability of the results by ensuring that that players have a regular time and quiet place to lie down for a few minutes before training to record the necessary data. Consistency is key. Trainers, like Kuchno, skilled enough to support the preparation of elite athletes often face special challenges. In addition to their professional commitment to Hertha BSC, many players under his care also have national team obligations, and not surprisingly for a top club, many the younger Germans also play for the country’s developmental age group squads. Ultimately, putting data to work for the team comes down to organization. Regardless of whether the data arrives from the league office, or is produced using the team’s own monitoring tools. It all converges on a trainer’s desk, where someone needs to understand it and translate it into competitive advantages. Today, developing players, ensuring their safety, and optimizing the preparation that ensures they are ready to perform at the highest level is matter of science, where data is here to stay. At Hertha BSC, it’s Henrik Kuchno’s job to ensure keep things running and work towards the consistency and standardization that allows the team to succeed.